The advent of various e-commerce technologies in recent years (e.g. online payment systems, mobile user interfaces, etc.) has popularised online shopping in nearly all industries. These penetrations are either direct (e.g. the clothes-buying process can now be done entirely online) or indirect (e.g. a car buyer may gather information about a car’s specifications before going down to the showroom to collect it), and in both forms have changed the experiences of the consumer. Being part of the food industry, us here at Superlife Co. have always been grappling with the online-or-offline dilemma – is it better for consumers to buy products from brick-and-mortar stores, or from e-tail platforms such as Superlife Co.’s? As with everything, there are no black and white answers to this, as it very much depends on (a) type of product, (b) purpose of product and (c) personal preference, along with many other factors. Although we operate online primarily, we do not and will not sweepingly claim that online stores are the solution to every problem – because they are not. What we’d like to do in this article, rather, is to attempt to set up a ‘research question’ as specifically as possible, and answer it as objectively and succinctly as we can (after all, this is a blog article, not a thesis :P). 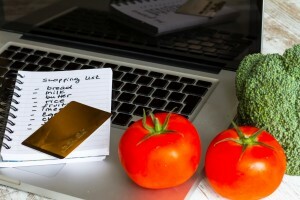 What are the Pros and Cons to Online Grocery Shopping? Although several supermarkets operate around the clock, online grocers allow you to shop whenever you feel like it – literally. If you wish to purchase something right now, you can do so at this very second, without leaving your sofa and consuming vehicle fuel to get to a supermarket. Should you wish to purchase a certain something, inter-grocer price comparison is as simple as opening up multiple tabs on your browser to make informed decisions. This is in contrast to having to physically walkto another supermarket, just to check the price of, say, a can of beans. The only queueing you’d be doing is waiting to receive the OTP from your credit card’s server. Goodbye to jostling with people whom you’re probably sick of after a long, tiring day at work! In addition, save yourself from sweating over looking for carpark lots at that crazily popular mall! Goodbye too to calloused fingers from carrying a ton of grocery or plastic bags! Shopping online allows you to receive your groceries while you’re watching Netflix, instead of working your biceps out with bags of protein and vegetables. What’s not to love? No products are made equal, especially when they are natural. For instance, some brands of apples are fresher when they are redder, and oranges become less firm when turning bad. Doing grocery shopping online removes this ‘choosing’ power from the shopper and leaves picking decisions to the logistics team. While grocers may claim to deliver high-quality products all the time, they would still need time and consistent performance to gain the trust of customers. At the end of the day, an online store is reliant on the uptime of their web hosts; it is only as alive as its web host is. Although this point is made moot in view of brick-and-mortar stores’ susceptibility to power outages, the lack of a store assistant next to you to troubleshoot problems on the spot such as failures in making cashless transactions disempowers the consumer. Sometimes we need more than sight to make a purchasing decision. For instance, product promoters for certain brands of meat are often deployed to supermarkets to give out samples to shoppers to entice them to make a purchase. Without such sensory information, it is difficult for online shoppers to learn about products they have little experience with, other than reading testimonials of those products. Due to the nature of grocery produce, items are often non-returnable and non-refundable, which increases the risk taken when making an online purchase of these goods. Such policies are in stark contrast to 100% money back guarantees like Superlife Co.’s, and are disarming given that information about products is relatively opaque online. There are several pros and cons of online shopping; the list above is barely comprehensive, and moreover it refers specifically to grocery shopping. At the end of the day, several factors come into play; in some contexts, a clear winner emerges. For instance, if one has decided to consume superfoods regularly because s/he is already convinced of their effectiveness, it makes more sense for him/her to purchase a bundle through electronic means (e.g. one of Superlife Co.’s quinoa), than to jostle with other shoppers in brick-and-mortar stores every month to purchase that particular something. Also, if a certain product cannot be tried in-store in the first place, then one is better off purchasing that product online, or first referring to testimonials about that online store should s/he have doubts (e.g. Superlife Co.’s testimonial features at the bottom of our page). Have any thoughts about this? Leave a comment below, or engage us on our Facebook page or Instagram platform. We always love hearing from our Superfriends!